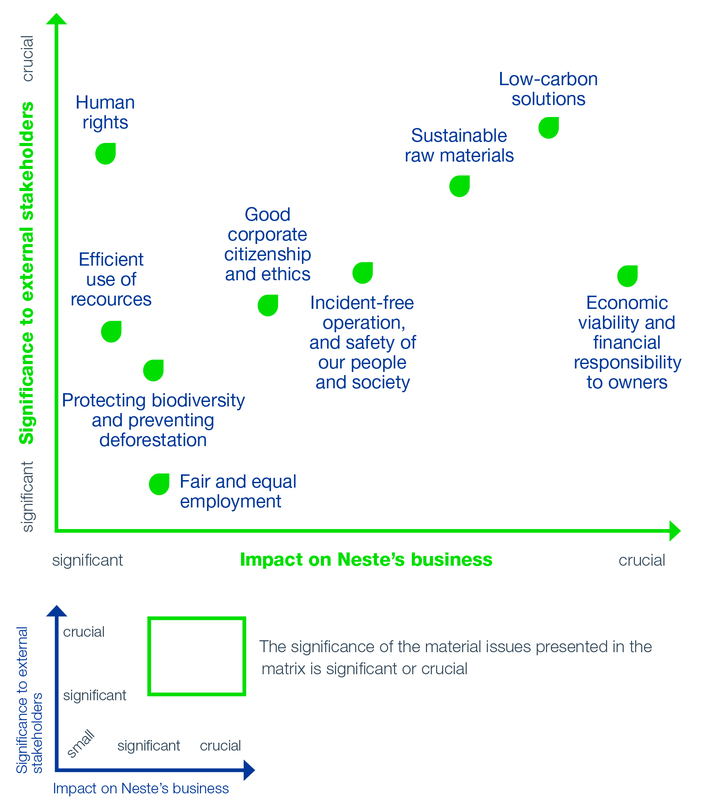 Neste's materiality matrix describes the key sustainability topics from the point of view of our business operations and stakeholders. The matrix is based on a materiality assessment conducted once every two years by engaging our key stakeholders in the process. The most recent one was conducted with almost 600 stakeholder representatives in fall 2016, and identified 24 material topics. In 2017, we regrouped and combined the 24 material topics into nine to ensure a tighter focus on them in Neste’s daily operations as well as in reporting. See our updated materiality matrix below. In the very beginning of 2018, we started conducting a materiality assessment to update our materiality matrix. We utilize the results of the material assessment in updating the company's sustainability work plan and developing the sustainability practices. We aim at communicating effectively on these themes and highlight them in our reporting. The material topics presented in the matrix have remained largely the same as in previous years. However, the materiality assessment clarified our view of needing to continue to invest in the development of new renewable products, management and transparency of the company's supply chains, and the portfolio of raw materials used. The content of our matrix was gathered in fall 2016 through an international online dialogue open to all our stakeholders. The dialogue focused on exploring our stakeholders' views on how we should develop the sustainability of our operations and what we should particularly focus on in our sustainability efforts. The invitation to participate was presented via personal email messages, in a digital newsletter to our stakeholders, as well as on our corporate website and social media channels. The stakeholders were also encouraged to distribute the message further themselves. Both external stakeholders (77% of the respondents) and our own employees (23% of the respondents) took part in the anonymous dialogue, which went on for approximately two weeks in two languages. The largest external respondent groups were consumers (22%), customers (10%), analysts and shareholders (8%), as well as suppliers of goods, services and raw materials (6%). In all, the dialogue involved almost 600 people from 17 countries or geographic areas, representing over ten stakeholder groups. Of them, as many as 450 respondents were particularly active in the dialogue. Our stakeholders used an online tool to assess sustainability topics they and others proposed. Also those topics considered the most important in 2014–2015 were included in the assessment. Altogether 28 representatives of our management and experts continued to process the 24 sustainability topics that the stakeholders had considered the most important by evaluating their importance from the long-term point of view of our business. 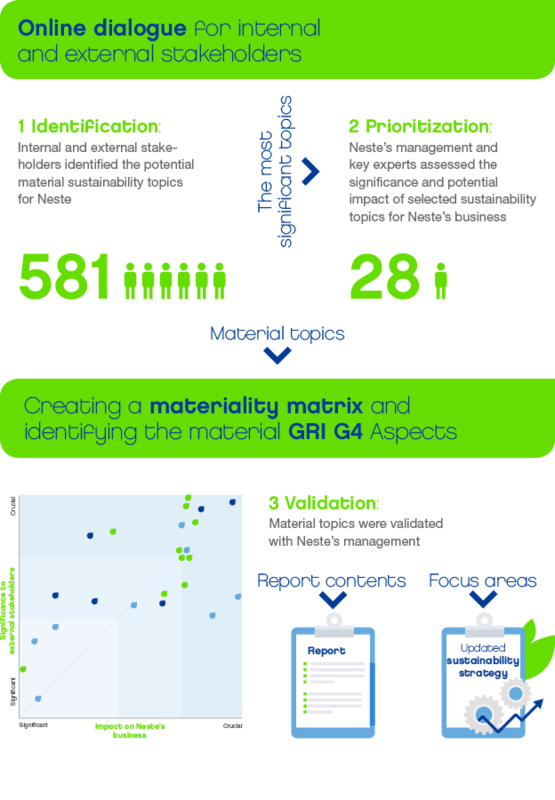 This process lead to Neste's materiality matrix which combines the sustainability topics that the stakeholders had considered the most important and the assessments of Neste's management and sustainability experts. Neste Executive Board approved the materiality matrix in October 2016. We communicated about the materiality assessment on our website in November.